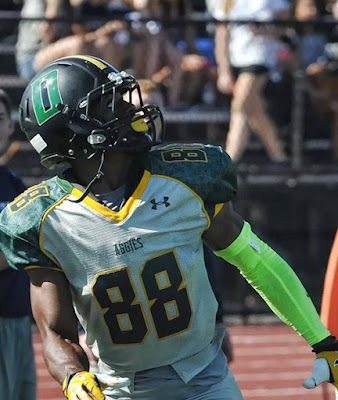 DOYLESTOWN (PA) -- Delaware Valley University's Rasheed Bailey is back on a National Football League (NFL) roster as the standout wide receiver has signed with the Jacksonsville Jaguars for their practice squad. Bailey was invited to preseason camp with his hometown Philadelphia Eagles and he shined in the summer, catching 10 passes for 100 yards, including a touchdown reception from quarterback Tim Tebow in the team's final preseason game against the New York Jets. He made it all the way to the end of camp, but was cut prior to the beginning of the regular season. Bailey has spent the last two weeks on the practice squad with the BC Lions of the Canadien Football League (CFL). One of the top players in Delaware Valley football history, Bailey finished his four years with the Aggies with 165 catches (third in school history) for a school-record 3,138 yards and 29 touchdowns (second). In 2014 alone, Bailey hauled in 80 passes for 1,707 yards and 19 touchdowns – all school records. The yardage and touchdown totals, as well as his average of 155.2 yards per game led all of Division III. Bailey set or tied single-game Aggie marks during the year for receptions (11), yards (252) and touchdowns (4 – twice). He caught nine or more passes five, went over the 100-yard mark nine times and caught multiple touchdowns in six of the team's 11 games.